This weekend it was my best friend's hen-do! It was a total surprise for her, all she knew was that she was going away! We whisked her down to Bournemouth and along with shopping and some good food we of course had a big night out! I want to try and do my fashion based posts so I thought I'd share with you my outfit from Saturday night, this will be a very short post but hopefully you guys will like something a little different to my usual posts! I bought this dress back in the summer and had completely forgotten about it until I was hunting through my new wardrobe on Friday night trying to think of things to pack! It is so comfortable and has the prettiest embossed pattern all over it, I love how different it is. They also do it in white and it is in the sale for £12 which is a total bargain (original price £35) - in fact it is the cheapest thing I'm wearing! Most of my outfits I had planned were super plain, being mainly black, so I thought getting a bright clutch bag would break it up a bit and brighten me up! I bought this from ASOS it was again in the sale for only £13.50 down from £35 - and by the looks of it, it is now sold out! I've mentioned these before on my blog in my May Favourites - they are the Rosalie Black Leather Look Buckle Demi Wedge from Boohoo! I got these months and months ago but because they go with so much I wear them all the time! They are so versatile and so comfortable (for the first few hours) - I love them. I'm also wearing my hair piece from Wonderland Wigs! I recently did a post on this (here) - I am obsessed with this thing and cannot wait to invest in some more! 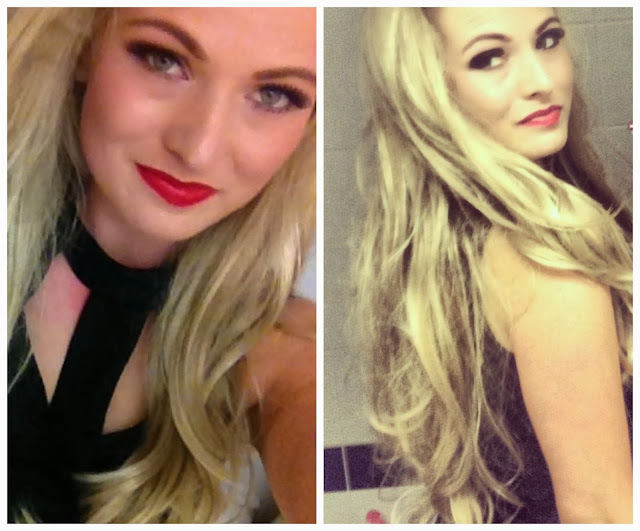 They look so natural and are so so easy to attach and wear.... slowly being converted from extensions here! Saves me so much time when getting ready - my real hair now just looks so short, thin and drab, I need one of these permanently attached to my head! I am also wearing Mac Studio Sculpt foundation, Rimmel's Apocalips in Big Bang and for my eyes I have used the Naked palette from Urban Decay and I have finished the look with Eylure 107 false eyelashes (as always!). Let me know what you think of this short post and if you like my blog please follow via GFC and Bloglovin - I am so close to hitting 500 followers on Bloglovin and I am starting a giveaway as soon as I hit it as a massive thank you to everyone - how exciting! Love this outfit and make up! :) The dress is just gorgeous! You look beautiful, I love your outfit. Need that lime clutch bag.......absolute steel at £13.50....nice find! !